While last night's "Game Of Thrones" premiere left the world abuzz, a few shrewd viewers caught a little lighthearted Easter Egg. If you recall, Ed Sheeran made a small cameo last season, which found the singer facing backlash for some reason, despite the fact that musicians have been appearing in Thrones for a minute; members of Snow Patrol, Coldplay, Sigur Ros, and Mastodon have all held it down with cameo appearances. Yet it would appear the writers have decided to respond to the backlash with a cheeky reference of their own. During a scene in which Bronn gets down and dirty with three prostitutes, one of them wonders about "Eddie," and the tragic fate that befell him. Looks like Ed Sheeran's character, the appropriately named "Eddie," found himself in Jaime Lannister's army at some point after meeting Arya Stark. Upon sacking Highgarden, Jaime's Lannister forces ultimately crossed paths with a Daenerys Targaryen scorned, who proceeded to rain Fire and Blood upon the Lannister forces - Eddie presumably among them. Luckily, the singer's survival instinct pulled through, though he did find himself disfigured for his troubles. In last night's episode, a few chatty prostitutes took a moment to reflect on poor "Eddie," claiming his face was burnt to a crisp, right down to his eyelids. 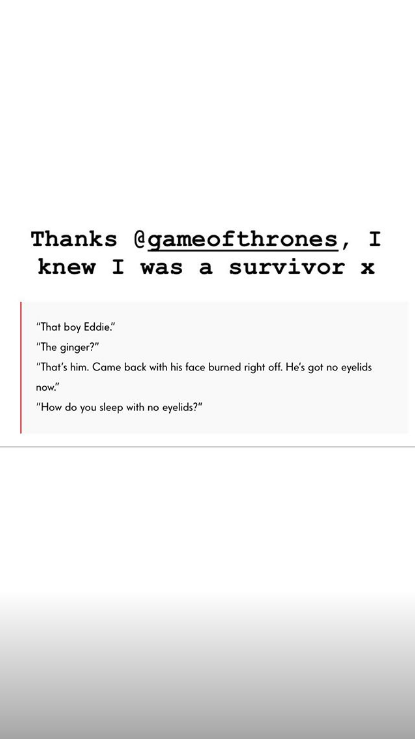 Despite the fact that he likely looks like a softened version of The Hound, Ed Sheeran took to Instagram to chime in on his character's gruesome fate. Ever the optimist, I might say. "Thanks Game Of Thrones," he writes. "I knew I was a survivor." While he fought bravely, it's almost more interesting to discern that poor Eddie was on a first name basis with some of King's Landing's prominent working girls. Perhaps he penned a Westerosi version of "A-Team" prior to his maiming. We'll never know.